Do you know what your favorite color might be saying about you? 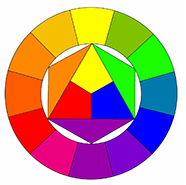 If you’ve ever worked with a color wheel, you’ve probably had a basic introduction to color theory. Most people know that blues and greens are considered cool colors, while reds and yellows are considered warm colors. So what does your own personal favorite color say about your personality? Color psychology provides a few clues. Most people agree that cool colors provide a feeling of calmness and quiet, while warm colors make people feel energetic and excited. We’re still not entirely sure how color can affect mood, though you will often recommendations about certain color schemes in interior design or clothing that supposedly help you tap those corresponding feelings. The significance of color may vary from culture to culture. Popular color-sayings can sometimes provide clues to perceived color meanings. In English we refer to things as “red-hot,” or describe a person being “green with envy.” We associate yellow with sunshine, which makes us think of brightness or happiness. Blue is often viewed as a mellow, competent color. So your favorite color may indicate the kind of person you are – or perceive yourself to be. Color can relate to something you feel you need. Do you love yellow? You might be a sunshiny person, always looking on the bright side, or perhaps you tend to melancholy and need a little more brightness in your life. Do you gravitate toward red? Perhaps you’re invigorating and energetic, or maybe you’re relaxed and need some liveliness in your life. The jury is still out on many things regarding color psychology. What colors mean to us is subjective. Much is culturally determined or personal, such as how colors may affect our mood, but many adults have a firm choice for a favorite. It can be fun to explore why you feel so strongly about a certain color. While you may have a favorite color, it does not mean that you can wear it successfully and look great. To learn more, check out our Personal Color Analysis Kit, or book a consultation. Color is wonderful when you learn to use it wisely.